The ongoing Ebola epidemic in the Democratic Republic of Congo (DRC) continues to spread through the country’s North Kivu province. The newest areas to be affected include the city of Butembo and a number of isolated areas that are hard to reach. As of 17 December, 490 people have been infected with the virus, including more than 270 deaths. The outbreak is now the second-largest ever recorded, after the 2014 West Africa epidemic, according to the World Health Organisation (WHO). 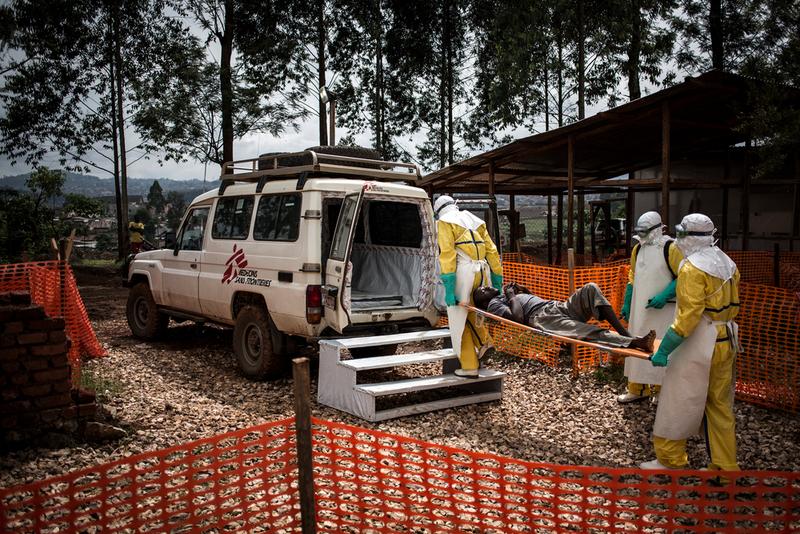 Teams from MSF continue to strengthen their efforts to help bring the epidemic under control. This outbreak is the DRC’s tenth and most serious epidemic of Ebola since the virus was discovered in 1976 near the Ebola River in what was then called Zaire. “We are very concerned by the epidemiological situation in the Butembo area. We now know that this outbreak will last and that we must increase our efforts to get it under control." Forty years later, despite a massive and coordinated mobilisation by the WHO, the Congolese Ministry of Health and organisations such as MSF, this current outbreak of the deadly virus is still spreading. The newest urban locations to be affected are the city of Butembo, as well as Kalenguta, 25 kilometres north, and Katwa, 30 kilometres east. These places have all seen an increase in confirmed cases of Ebola as well as some resistance from the community. For now, the number of cases in Butembo’s city centre is low, but cases are rising quickly in its eastern suburbs and outlying isolated districts. “We are very concerned by the epidemiological situation in the Butembo area,” says John Johnson, MSF project coordinator in Butembo. “We now know that this outbreak will last and that we must increase our efforts to get it under control. MSF’s efforts to reach people with suspected Ebola living in isolated areas have had initial success. Health workers care for a patient with suspected Ebola inside the treatment centre. New cases are being reported from these areas and patients are being brought to Butembo, where MSF manages an Ebola treatment centre in collaboration with the Ministry of Health. The number of beds in the Butembo centre has recently been increased to 64. In Mangina, where the epidemic started, no new cases have been reported for several weeks. “We should be able to end our activities in the treatment centre shortly,” says Axelle Ronsse, coordinator of MSF’s Ebola response. Community health workers being briefed and trained on Ebola by MSF health promoters in Bunia. In Beni, the number of cases per week remains stable. However, new cases are still being confirmed on a daily basis. “To fight this, we have stepped up our medical and health operations by opening a 48-bed transit centre that remains busy,” says Ronsse. Team members hug each other once in their protective equipment - the only time it is safe to have contact. Antoine is in charge of health promotion activities at Butembo Ebola treatment centre. “My daily work is essential in addressing the epidemic,” says Antoine. “We want to encourage people to come and get treated as quickly as possible. We also spread the message that recovering from Ebola is possible. We ask every survivor who leaves our centre to become an ambassador and raise awareness by telling their story. “Some people who are now immune to the virus can, in turn, provide valuable help, particularly looking after children isolated from their families.